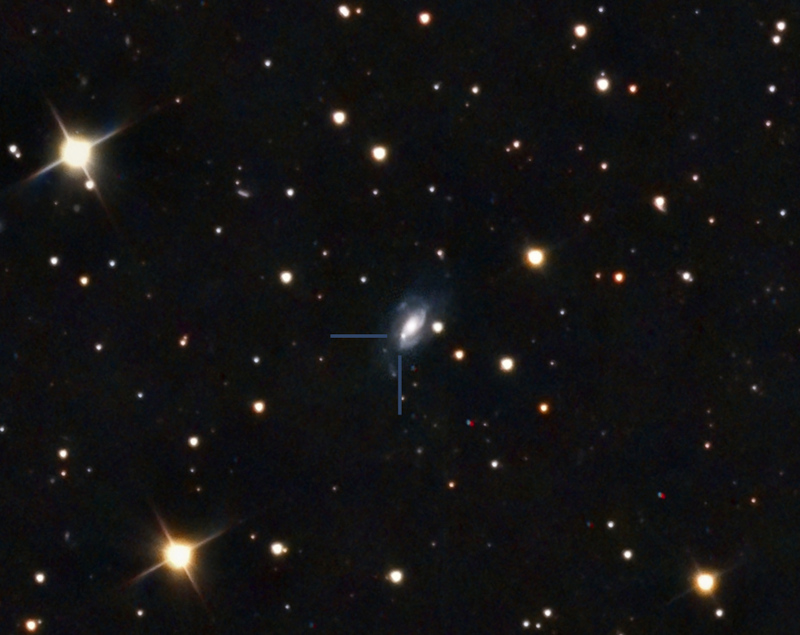 Tim Puckett and his team was just awarded a supernova discovery in a small (2′), faint (mag 17) galaxy, UGC 10936 in Draco. The seeing at the SRO site at 1400 m elevation was near 1" and the full moon was out for this LRGB image. Tim asked us if we would like to image this object. The IAU text is shown below. Feb. 24.52 UT in the course of the Puckett Observatory Supernova Search. 19.1) taken by T. Orff on Feb. 25.48 with a 0.40-m reflector at Portal, AZ. 2000.0), which is 4".9 east and 9".8 south of the center of UGC 10936.
superseded by text appearing later in the printed IAU Circulars. Paul provided an older dss plate of this object and I used Registar to register both images and create an animiated GIF.